Trésor Sparkling is a fragrance of dazzling radiance with the freshness of pear, the embrace of white rose and violet and the warmth of sandalwood. True love illuminated. Other recent releases from Lancôme: Hypnôse Sheer, Hypnôse Homme. 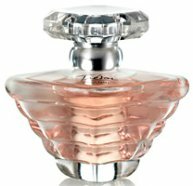 I'm very interested as I love their last limited edition of Trésor (Sheer). The notes seem interesting, I love the smell of white rose.